Was the year that our ancestors sailed from New Orleans via Cape Horn and homesteaded in the Santa Clara Valley in California. This is where Andrew Swickard, with his wife Susannah and two children, established their ranch and began producing grain and livestock. Andrew’s son, Harvey Swickard, married Isabel McQuene, whose family had travelled to California from Indiana via ship and crossed the Isthmus of Panama via foot. 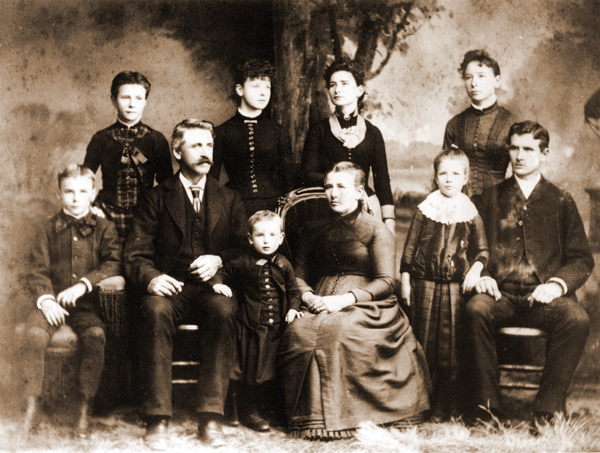 Harvey and Isabel had eight children and expanded the family’s horse operation to supply the booming city of San Francisco with transportation. John Harvey, son to Harvey and Isabel Swickard, soon took over the ranch and married Mary Ellen Cothran. Mary Ellen’s family travelled by wagon train from Kansas in 1859 and started with a 1,000 head of cattle only to arrive in California with 250 head. Their son, John Abraham, and his wife Evelyn Boeger eventually took over the ranch and had two sons, Jack and Tom. By 1949, with guidance and direction from his father, Jack at the age of 15 became one of the youngest purebred Hereford breeders in the nation and the youngest commercial breeder in the Santa Clara Valley. A local news article had Jack quoted saying, “ I don’t plan to make a million, but to built up a good foundation herd and develop something of a name, and this takes time.” With this mindset, Jack was able to successfully take over the family operation and made a name for the Swickard Ranch. He married Margret Hangstabeck and had two sons, Tim and Todd. Was the year that Jack Swickard, Margret and their two sons bought a ranch in Susanville, CA and made the move north. With cattle ranching as his passion, Jack started Five Dot Land and Cattle Company in Lassen County with 200 registered Hereford cattle. Tom Swickard, Jacks brother, was able to join them four years later and since both brothers have developed successful cattle, haying and land operations. In 1994 Jack’s son, Todd, took over the daily operations of the ranch. Since then, Todd and his wife, Loretta, have maintained a predominately angus cattle herd, and developed a natural beef program in 2006 called Five Dot Ranch. Originally, the business started selling product at farmers markets throughout Northern California. This opened the door to acquire a permanent location at the Oxbow Public Market in Napa, CA in January of 2008. Five Dot Ranch sells only their beef from cattle solely owned and raised on their ranch and can be found at various restaurants and markets throughout Northern California. Today the operations of Five Dot Ranch are continued through Todd, Loretta and their four children, Kirby, Lindsay, Kaitlin and Logan, whom make up the seventh generation of this California legacy. The product continues to be sold wholesale to restaurants and markets as well as at their own butcher shop and restaurant in Napa, CA.